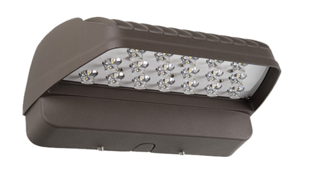 The Aleo WPL™ G2 Series LED Wall Packs combines energy-efficiency, advanced optical control, and modern slim profile aesthetics to deliver enhanced performance to outdoor wall mount lighting applications. Rugged die-cast housing provides advanced thermal management for long life and weather-proof compartment to withstand challenging, outdoor environments. Outdoor wall-mount applications. Building facade. Retail, commercial, industrial exteriors. Our LED Wall Packs include Precision-formed optical lens system that improves safety and security by delivering high-efficiency illumination with precise optical distribution. Type III Med. distribution comes standard. See warranty documentation for more information. Luminaire comes standard mounting plate for quick and easy installation. Suitable for use with sensors and daylight harvesting to achieve deeper energy-savings and code compliance. Sensor accessory available: occupancy sensing with daylight cut-off and photocell (must order with wall pack extension accessory).